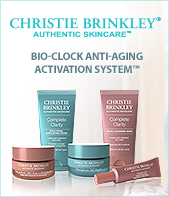 Christie Brinkley's “BIO-CLOCK SYSTEM” Save Over $175! Includes Auto Delivery. Get your 100% Bonus Gifts with Promo Code: CHRISTIE at checkout. Get Many Special T.V Offers, gives you an Authentic Skincare. Shop Now! Christie Brinkley Authentic Skincare is a breakthrough anti-aging skincare line that works to recapture your skin’s youthful appearance while revitalizing and reversing signs of aging, improving problem skin, and protecting against the full spectrum of damaging sun rays. Christie’s passions for skincare, anti-aging treatment, and sun protection led her to share her skincare secrets with the world. Found a coupon for Christie Brinkley Authentic Skincare?